Superbly located in the very heart of Brussels, adjacent to one of the most beautiful squares in Europe, Grand Place, close to Brussels’ financial district and within easy walking distance of the antiques district of Le Sablon, Hotel Amigo now provides a stylish and central base from which to explore the city. 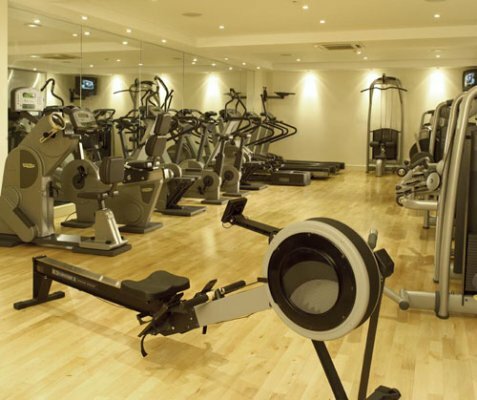 It has a new Fitness Centre equipped with the latest machines to give the guests the opportunity to work out and unwind. 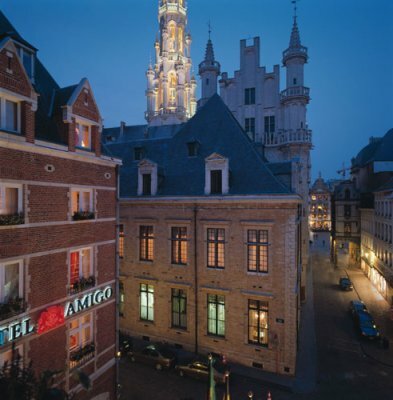 Superbly located in the very heart of Brussels, The Hotel Amigo is adjacent to one of the most beautiful squares in Europe, Grand Place as well as being close to Brussels’ financial district. Hotel Amigo has six private events rooms, from larger rooms accommodating up to 160 people to intimate suites with their own roof terraces. 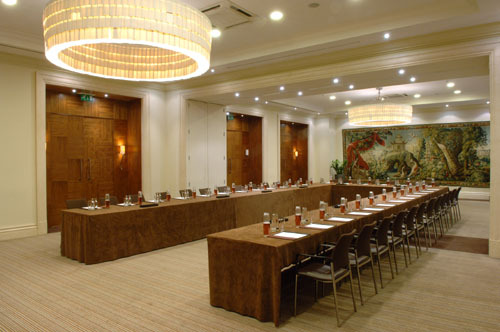 The most modern technology is available for your board meeting, presentation or gala dinner. 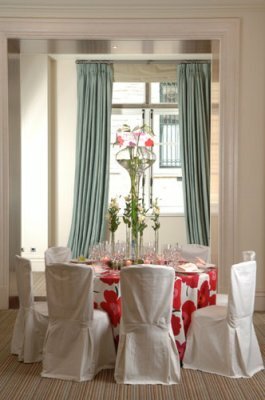 Your wedding day is one of the most important days in your lifetime, a special time to be shared with family and friends. Hotel Amigo provides a stylish venue to celebrate your marriage, where unsurpassed service and attention to detail are our specialities. 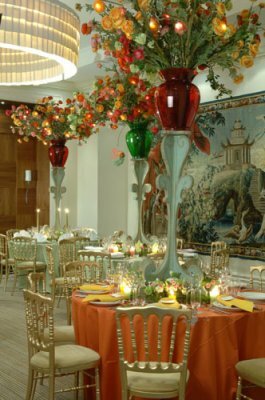 We will make your special day as perfect and relaxing as possible so that you are free to enjoy each other and your guests. 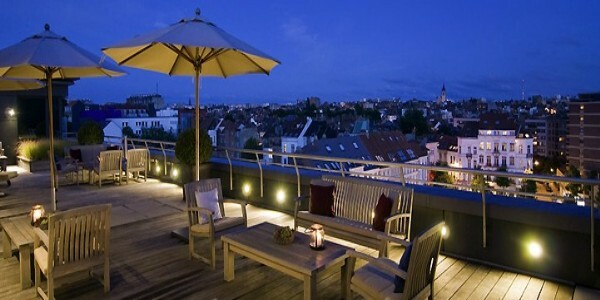 Hotel Amigo offers a variety of bedrooms and suites, which are individual in style. Some rooms have views through to the Town Hall, whilst others look out over the churches and spires of the city. Good-sized bathrooms contain mosaic details in red or green to match their marble vanity tops, and figures of Hergé’s characters Tintin, Snowy the dog and Captain Haddock enliven the walls with a touch of humour. All have a king-size bed with comfortable chairs and writing desks. 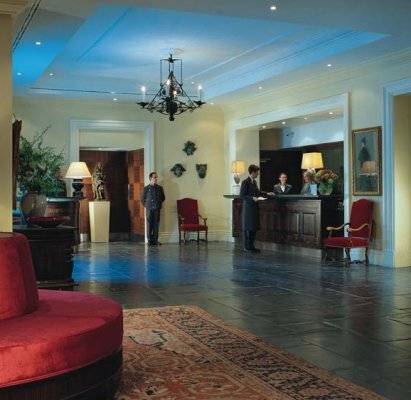 In-room air conditioning, marble bathrooms, computer and fax connections with digital and analogue lines, dual-line phones, voice messaging, interactive satellite television, minibar, safe and trouser press. Some have views over the town hall. 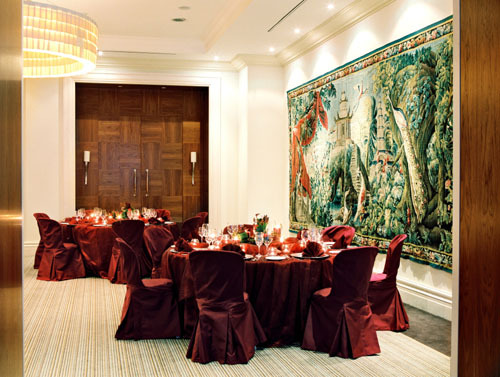 Larger than the Classic rooms, they offer the same facilities and different city or courtyard views. 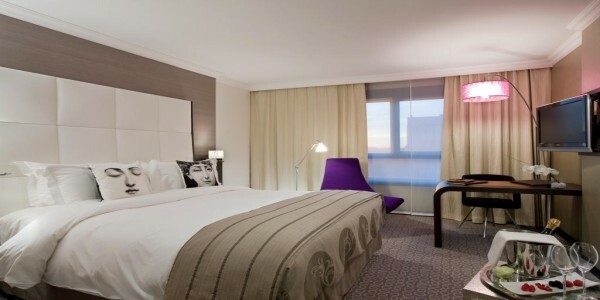 Spacious bedrooms with a self-contained seating area in addition to all the facilities offered in all our rooms. 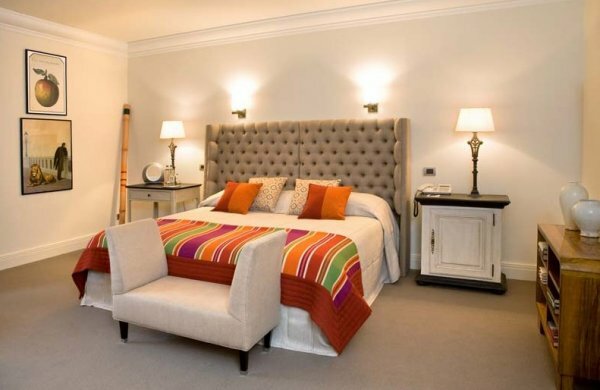 The Classic King bedroom at Hotel Amigo measures 28 sq m/ 300 sq ft and incorporates a king bed. 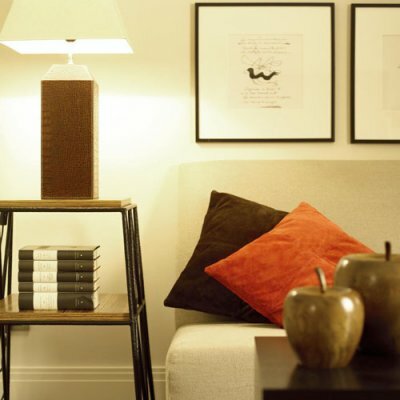 The room has been designed in a fresh, contemporary style with carefully chosen ceramics, artworks and fabrics. This room also provides individual heating/cooling systems and spacious working desks with two telephone lines and Broadband internet connection. Guests will benefit from facilities such as a private dining menu, well-stocked in-room bar and snack basket, satellite television, security safe, professional hairdryer and storage space. The spacious bathroom of our Classic King bedroom is finished in red or green mosaic detail to match the marble vanity tops; figures of HergÃ©’s characters Tintin, Snowy the Dog and Captain Haddock enliven the walls with a touch of humour. Rocco Forte Collection Hotels exclusive range of luxurious bathroom products, make-up mirror and fluffy bathrobes are available for guests’ use. The Classic Twin bedroom at Hotel Amigo measures 28 sq m/ 300 sq ft and incorporates twin beds. The room has been designed in a fresh, contemporary style with carefully chosen ceramics, artworks and fabrics. This room also provides individual heating/cooling systems and spacious working desks with two telephone lines and Broadband internet connection. Guests will benefit from facilities such as a private dining menu, well-stocked in-room bar and snack basket, satellite television, security safe, professional hairdryer and storage space. he spacious bathroom of our Classic Twin bedroom is finished in red or green mosaic detail to match the marble vanity tops; figures of HergÃ©’s characters Tintin, Snowy the Dog and Captain Haddock enliven the walls with a touch of humour. Rocco Forte Hotels exclusive range of luxurious bathroom products, make-up mirror and fluffy bathrobes are available for guests’ use. The Deluxe King room at Hotel Amigo measures 32 sq m/ 345 sq ft and incorporates a king bed. The room has been designed in a fresh, contemporary style with carefully chosen ceramics, artworks and fabrics. 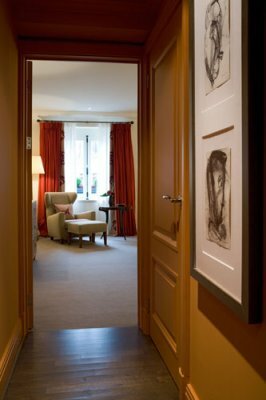 The Deluxe King room features views either through to the Grand Place or over the churches and spires of the city. This room also provides individual heating/cooling systems and spacious working desks with two telephone lines and Broadband internet connection. Guests will benefit from facilities such as a private dining menu, well-stocked in-room bar and snack basket, satellite television, security safe, professional hairdryer and plenty of storage space. The spacious bathroom of our Deluxe King room is finished in red or green mosaic detail to match the marble vanity tops; figures of HergÃ©’s characters Tintin, Snowy the Dog and Captain Haddock enliven the walls with a touch of humour. Rocco Forte Hotels exclusive range of Italian bathroom products, make-up mirror and fluffy bathrobes are available for guests’ use. The Deluxe Twin room at Hotel Amigo measures 32 sq m/ 345 sq ft and incorporates twin beds. The room has been designed in a fresh, contemporary style with carefully chosen ceramics, artworks and fabrics. 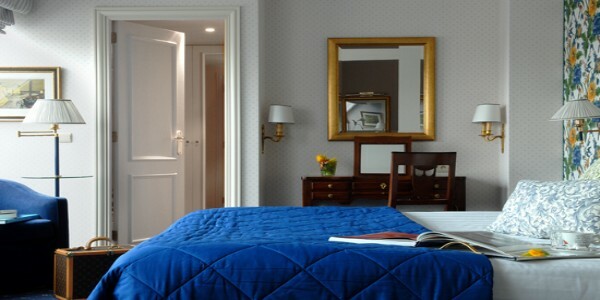 The Deluxe Twin room features views either through to the Grand Place or over the churches and spires of the city. This room also provides individual heating/cooling systems and spacious working desks with two telephone lines and Broadband internet connection. Guests will benefit from facilities such as a private dining menu, well-stocked in-room bar and snack basket, satellite television, security safe, professional hairdryer and storage space. The spacious bathroom of our Deluxe Twin room is finished in red or green mosaic detail to match the marble vanity tops; figures of HergÃ©’s characters Tintin, Snowy the Dog and Captain Haddock enliven the walls with a touch of humour. Rocco Forte Collection Hotels exclusive range of luxurious bathroom products, make-up mirror and fluffy bathrobes are available for guests’ use. The Executive room at Hotel Amigo measures 36 sq m/ 385 sq ft and incorporates a king bed. The room has been designed in a fresh, contemporary style with carefully chosen ceramics, artworks and fabrics. The Executive room offers a self-contained seating area and also provides individual heating/cooling systems, spacious working desks with two telephone lines, Broadband internet connection and a DVD-player. Guests will benefit from facilities such as a private dining menu, well-stocked in-room bar and snack basket, satellite television, security safe, professional hairdryer and plenty of storage space. The spacious bathroom of our Deluxe King room is finished in red or green mosaic detail to match the marble vanity tops; figures of HergÃ©â€™s characters Tintin, Snowy the Dog and Captain Haddock enliven the walls with a touch of humour. Rocco Forte Hotels exclusive range of Italian bathroom products, make-up mirror and fluffy bathrobes are available for guests’ use. The junior suite has a separate living room with working desk, a sleeping room with a king size bed, a dressing room, a spacious luxury marble bathroom with separate stall shower, heated towel rack and provided with luxury amenities, bathrobe, slippers, individually controlled air conditioning, computer and fax link-ups with digital and analogue lines, broadband internet connection, personal in-room safe, mini-bar, fully integrated television system from Bang & Olufsen, in-house movies-program, trouser press, DVD-player and I-pod docking station. 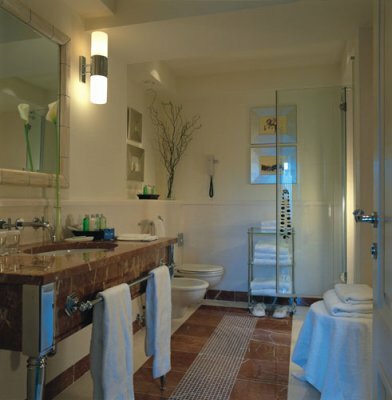 A spacious luxury marble bathroom with separate stall shower, heated towel rack and provided with luxury amenities. •Complimentary use of a NOKIA mobile phone for all local calls and complimentary local calls from your suite. *The Rocco Forte Suite Experience is not available to Junior Suites guests or upgrades. The Deluxe Suite at Hotel Amigo measures 80 sq m/ 860 sq ft and incorporates a spacious lounge and a seating area with a working desk, as well as a bedroom which features a king bed. 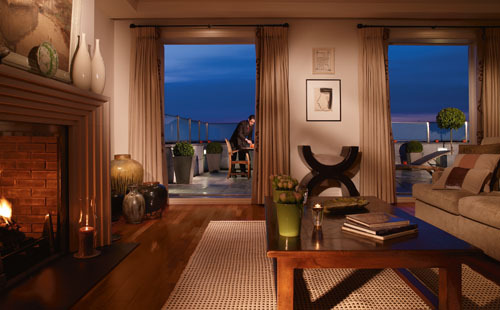 The suite has been designed in a fresh, contemporary style with carefully chosen ceramics, artworks and fabrics. 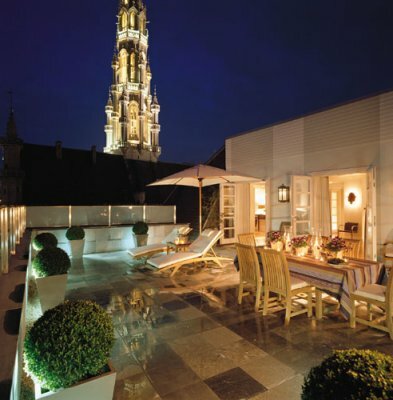 The Deluxe Suite features a beautiful view of the Grand Place. This room also provides individual heating/cooling systems and spacious working desks with two telephone lines and Broadband internet connection. Guests will benefit from facilities such as a private dining menu, well-stocked in-room bar and snack basket, satellite television, security safe, professional hairdryer and plenty of storage space. The spacious bathroom of our Deluxe Suite offers a separate shower and is finished in red or green mosaic detail to match the marble vanity tops; figures of Herg’s characters Tintin, Snowy the Dog and Captain Haddock enliven the walls with a touch of humour. Rocco Forte Hotels’ exclusive range of Italian bathroom products, make-up mirror and fluffy bathrobes are available for guests’ use. The Classic Suite at the Hotel Amigo measures 70 sq m/ 750 sq ft and incorporates a separate living room with a working desk, as well as a bedroom which features a king bed.The suite has been designed in a fresh, contemporary style with carefully chosen ceramics, artworks and fabrics. 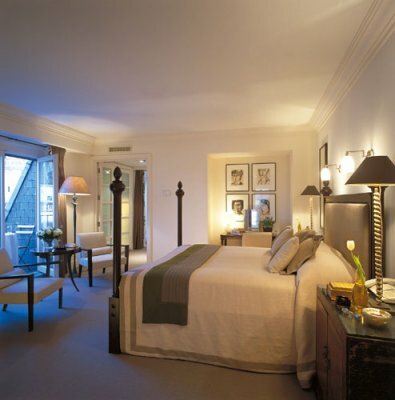 The Grand Suite features a beautiful view of the Grand Place. This room also provides individual heating/cooling systems and spacious working desks with two telephone lines and Broadband internet connection. Guests will benefit from facilities such as a private dining menu, well-stocked in-room bar and snack basket, satellite television, security safe, professional hairdryer and plenty of storage space. The spacious bathroom of our Grand Suite offers a separate shower and is finished in red or green mosaic detail to match the marble vanity tops; figures of Herg’s characters Tintin, Snowy the Dog and Captain Haddock enliven the walls with a touch of humour. Rocco Forte Hotels’ exclusive range of Italian bathroom products, make-up mirror and fluffy bathrobes are available for guests’ use. The Presidential suite Rene Magritte at Hotel Amigo measures 110 sq m/ 1200 sq ft and incorporates a spacious lounge with a seating area and a working desk, as well as a bedroom which features a king bed. 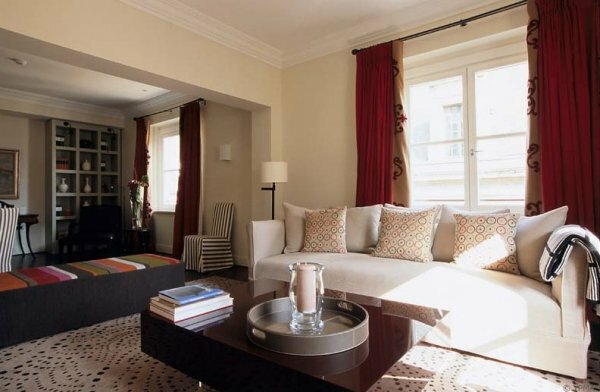 The suite has been designed in a fresh, contemporary style with carefully chosen ceramics, artworks and fabrics. The Suite Magritte features a beautiful view of the Grand Place. This room also provides individual heating/cooling systems and spacious working desks with two telephone lines and Broadband internet connection. Guests will benefit from facilities such as a private dining menu, well-stocked in-room bar and snack basket, satellite television, security safe, professional hairdryer and plenty of storage space. The spacious bathroom of our Suite Magritte offers a separate shower and is finished in red or green mosaic detail to match the marble vanity tops; figures of Herg’s characters Tintin, Snowy the Dog and Captain Haddock enliven the walls with a touch of humour. Rocco Forte Hotels’ exclusive range of Italian bathroom products, make-up mirror and fluffy bathrobes are available for guests’ use. The spacious bathroom of our Blaton Suite offers a separate shower and is finished in red or green mosaic detail to match the marble vanity tops; figures of Herg’s characters Tintin, Snowy the Dog and Captain Haddock enliven the walls with a touch of humour. Rocco Forte Hotels’ exclusive range of Italian bathroom products, make-up mirror and fluffy bathrobes are available for guests’ use. The Bar Amigo is located next to the foyer and the restaurant. From there you can have a look the cobble stoned streets of Brussels and its famous town-hall. Olga Polizzi, Director of Design of Rocco Forte Hotels, supervised the renovation. Today the ‘Bar Amigo’ has a stylish and modern charisma.To remind all the famous writer lodged in the Hotel Amigo for the last 50 years, pictures and quotations are hanging on the walls. The interior is contemporary with its parquet floor and leather furniture in dark red and anthracite. This and the music which is played in the bar create an ideal ambiance to relax a bit. The ‘Bar Amigo’ is well-known for its exquisite choice of precious spirits . 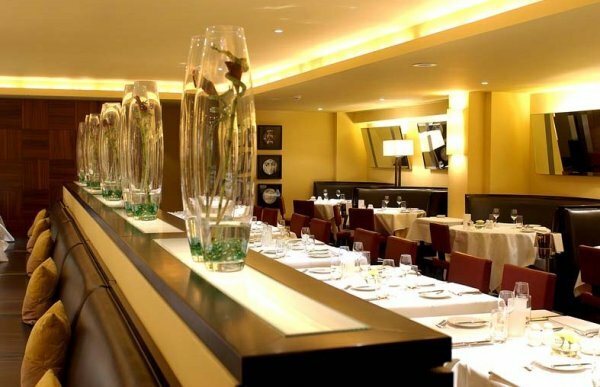 At lunch time our Chef serves a fine and authentic Italian cuisine in the lounge. To be continually creative and offer the freshest seasonal products, a daily menu is proposed.Afterwards you can enjoy a cup of tea during the ‘Belgian Tea Time’. In the the Hollywood films the cocktail hour was a transformation phase that offered to the director the occasion to abandon a little the action to the profit of the narration. Nowdays not too much has changed in the real life, the cocktail is still a time of reflexion, narration and rest restoring. The cocktails of the Martini club have already become the point of reference in town. Our cocktails will offer you a unique experience in the stylish and classy atmosphere of the Amigo Bar.